The V3 AC kits will ship out to you in the order in which final payments are received, due to the magnitude of kits sold in this sale we expect the first half of these to ship in 2-3 weeks and the remaining in roughly 6-8 weeks. and Alternator in their factory positions. set-up to eliminate boost creep! 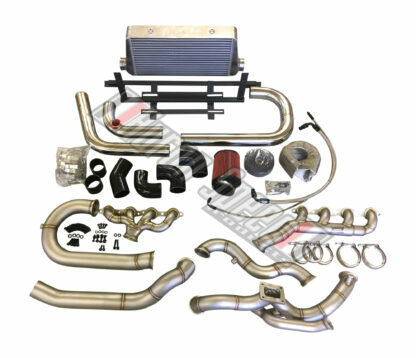 -3” 2-piece Downpipe with Wideband O2 bung and plug. -(2) 3″ V-band clamps for easy installation of the downpipe. in order to fit the piping around the A/C Compressor and steering shaft. -Included Manifolds. No need to have to track down rusty Truck Manifolds anymore. Where as they worked great, we now supply manifolds for you to keep the entire process much more simple on your end! These new manifolds are made from.120 wall 304 Stainless. If you know your materials, you know this is VERY heavy duty stuff. Most headers are made from .065 wall making these manifolds nearly twice as thick of material to prevent cracking from holding up the weight of the turbo. They are also V-banded for ease of install and made to RETAIN the OEM alternator location and this version of course the A/C Compressor as well! -New Wastegate Location. We have seen a few cases where boost creep became a minor issue, but why have to worry or hassle with it at all? We took what we know needed to happen to get a better flow of exhaust to the waste gate and made it happen. 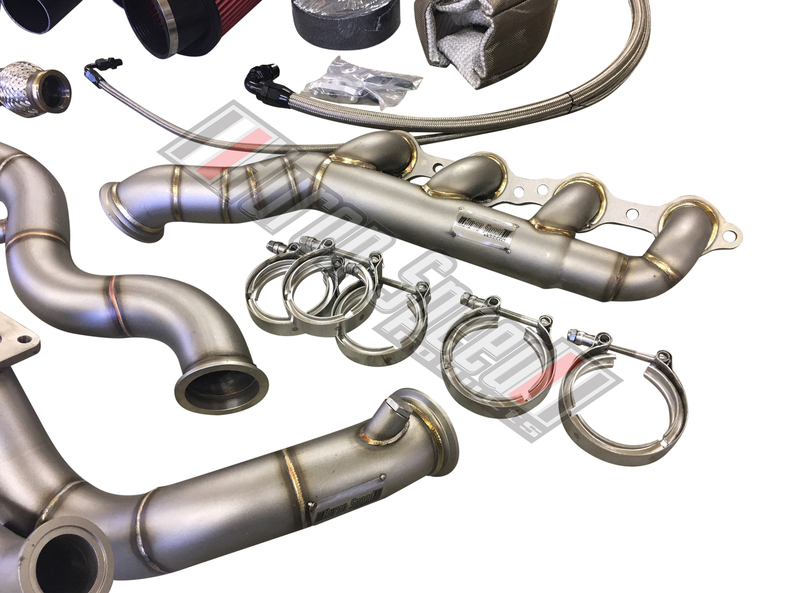 Where as our previous kit and most others out there pull from the merge of the 2 banks with a 38mm flange, we are now pulling exhaust from BOTH banks individually in the direction of flow, and merging those into larger piping and a larger 44-45mm WG flange! Good-bye boost creep! 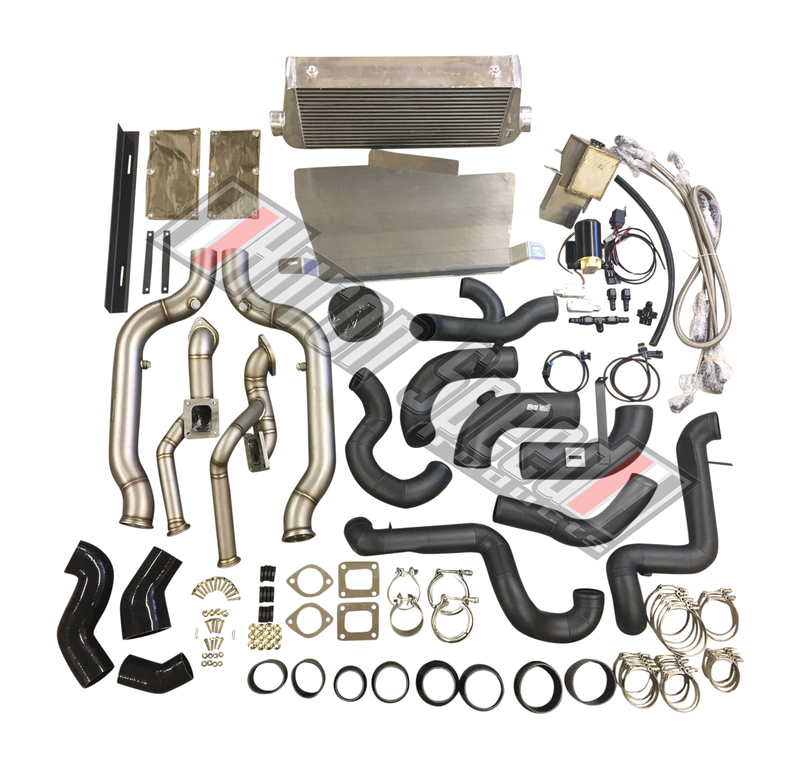 Wastegate dumps to the atmosphere. -Keep your Sway Bar. Where as not as big of a demand, we still would get street car customers who really wished to retain their front sway bar. With a little fabrication, we made it happen! We routed the crossover to run just under the front sway bar on the passenger side and right above the bar on the drivers side without sacrificing any ground clearance. We also did this while keeping a larger SS/WS6 sway bar in the OEM location! -Fit a Mid-Frame T4. 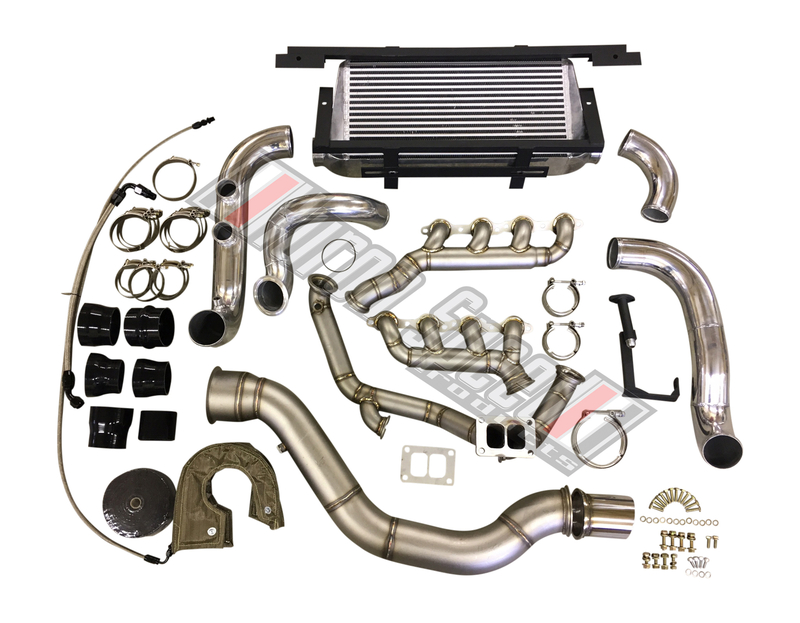 Our previous kit did not have enough clearance to the factory radiator to fit a mid-frame T4 turbo such as a PT88, a T4 BW, or a Mid-frame Turbonetics nor did the hot side have the proper set-up to support the extra weight. With our new design, and the extra thick stainless piping used on the cold side, supporting the extra weight will not be an issue! Also we managed to find the proper angle on the T4 flange to fit your standard T4 turbo or a Mid-Frame turbo on it while still clearing the factory radiator in the factory, untouched position! 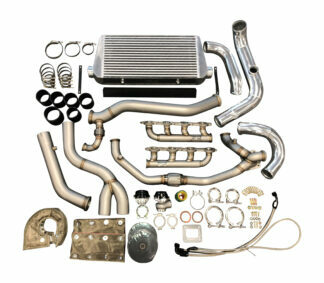 -4″ Downpipe option. 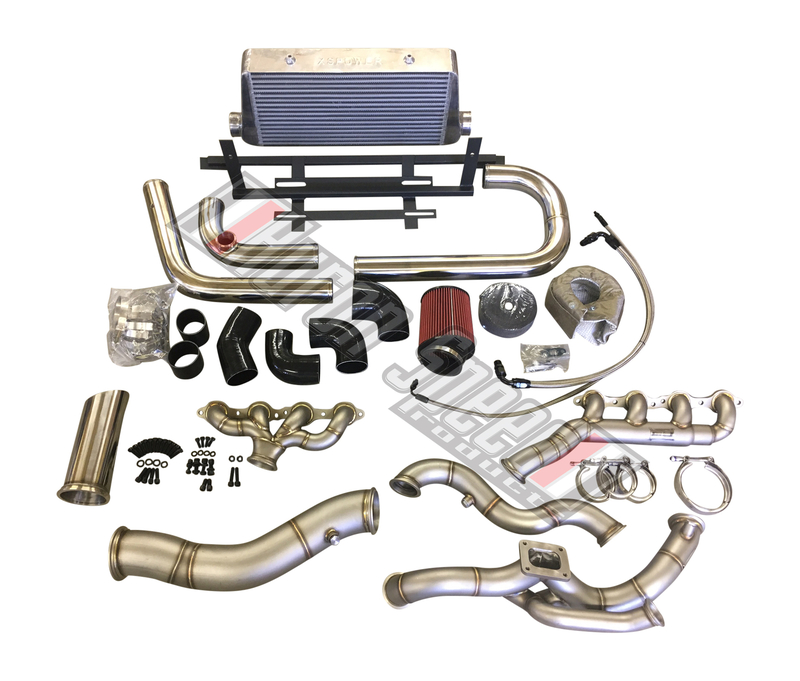 Mainly for those wanting to run the mid-frame turbos, we also have a down pipe solution for you as well considering they come with a 4″ down pipe discharge opposed to the 3″ of a standard T4 turbo. 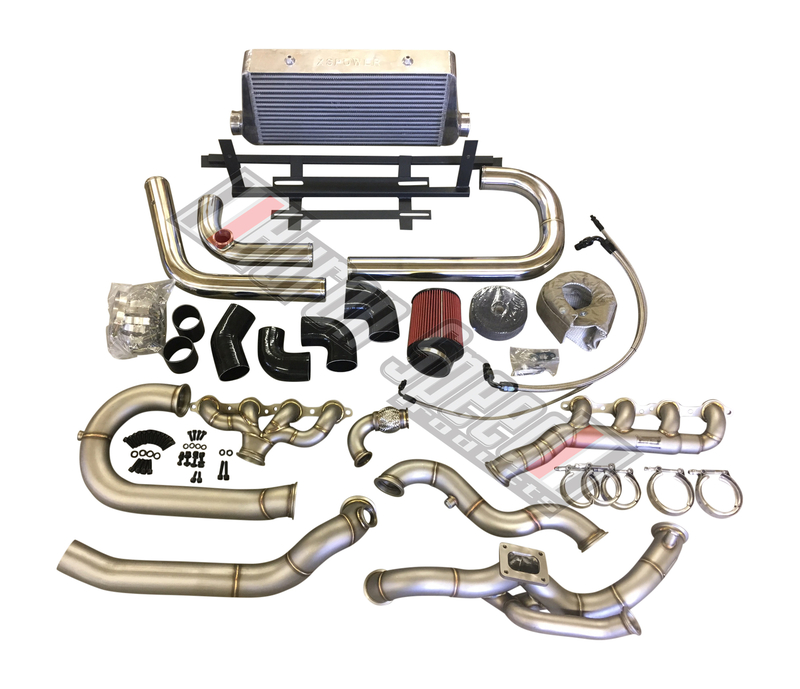 With this, we have developed a 2-piece 4″ down pipe that will exit the front bumper on the passenger side. With this, you will still be able to retain your OEM Radiator in the OEM Location! 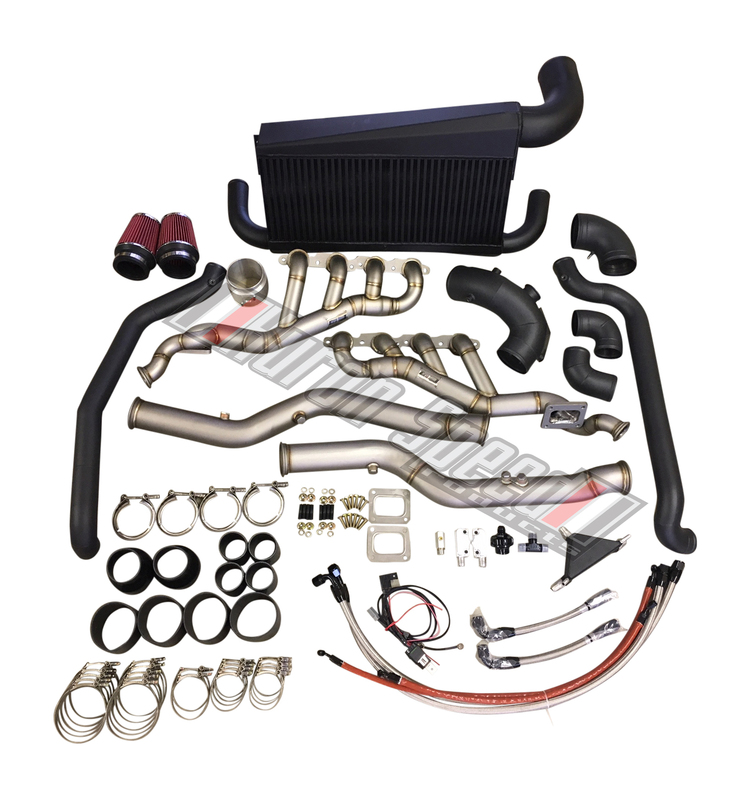 Requires removal of the factory coolant overflow tank to fit the 4″ Bumper-Exit downpipe. -Wideband O2 bung. This is now standard. We are putting an extra O2 bung in the supplied 3″ through K-member down pipe along with a plug so you can run this, or have it there if when the time comes for tuning or logging purposes. This is a standard feature!